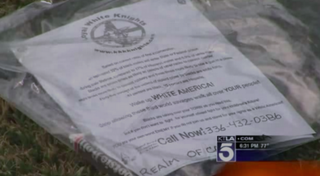 Whittier, Calif., residents found Ku Klux Klan fliers on their front lawns Sunday morning, prompting shocked responses from neighbors, the Los Angeles Times reports. According to the report, one block in the neighborhood received plastic bags with the fliers, which declared “Wake Up WHITE AMERICA!” along with a rock and some candy, local police told the news site. “When I first read it, I thought it was a hoax,” Whittier resident Stella Paquin told the Times. Since Whittier police could find no specific threats in the fliers, investigators declared that no crime had occurred. As the Times notes, this is the second time in as many weeks that fliers from the white supremacist group have been found by unsuspecting residents in California neighborhoods. Last week, in the same manner, 100 homes in Fullerton, Calif, received such fliers, filled with criticism of black, Latino and Jewish people.